72 x 103 ½ in. This life-size portrait of an unknown hunter is considered to be the collaborative work of Pieter Thijs and Pieter Boel. Both artists were born in Antwerp and became members of the Guild of St. Luke in 1644 and 1650, respectively. Credited with the image of the hunter in this painting, Thijs was known for large-scale religious compositions and elegant portraits. The game and dogs are attributed to Pieter Boel, a specialist in animal painting who was an accomplished still life painter. Boel was active in France after 1668 and served as Peintre Ordinaire to Louis XIV (1638 – 1715). While in France, Boel produced tapestry designs for the Gobelins factory and made studies of animals in the royal menagerie. Collaborative efforts between artists were not uncommon at the time; specialists in areas such as portraiture, landscape, or still life often worked cooperatively to accommodate the wishes of a patron. 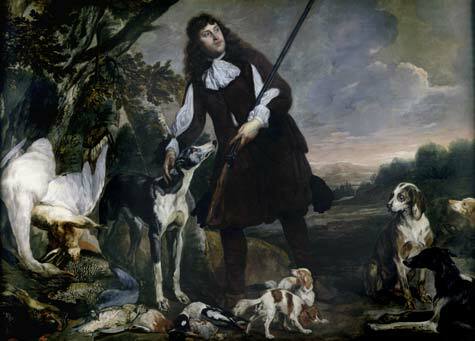 Hunting scenes became popular artistic subjects in the Netherlands during the 17th century. The sport was a favorite among the nobility and was also enjoyed by the wealthy merchant class. Images of hunters with the abundance of their sport were often commissioned to commemorate specific events and desired for their decorative value. The wide variety of small game included here indicates the skilled hunter's marksmanship.